← Ladies Only Camping Trip..
or in common terms, picking and drying lots and lots! 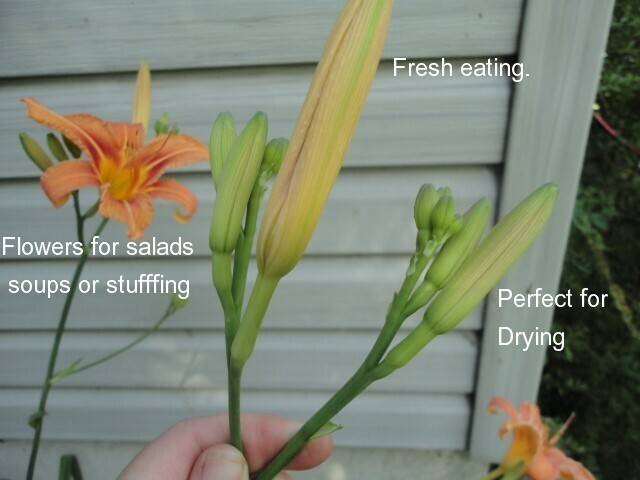 of unopenned Day Lily flowers. Ah, the common, humble daylily that most of us call, tigerlily’s or Ditch Lily’s are so wonderful to have in the kitchen, the little root bulbs are good eating, with a taste like a mix between a regular an sweet potato, the greens are useable (but I don’t find them worth it unless very early spring eating) the open flowers can be added to salads for color or stuffed for little nibbles. But the darling for me of this plant is the unopened flowers, the big ones are awesome for fresh eating, my favorite way is to just quick stirfry them with a little butter and lemon, or to cut them up and put them into a fresh veggie side dish. 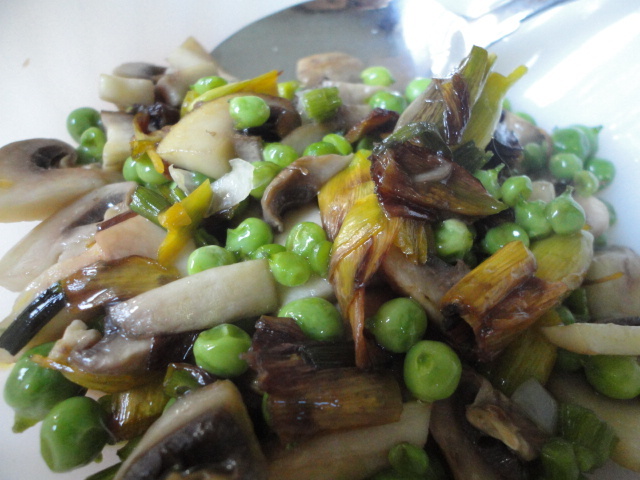 A dozen large unopened tiger lily flowers cut into three bites, 6 large mushrooms, Garlic greens and 3 cups of fresh baby green pea’s, lightly stirfried together. For fresh eating, I recommending picking the flower that is do to open tomorrow, and for drying, I pick both the flower to open tomorrow and the next biggest at about 2 to 3 inches in length, if you pick carefully, you are only taking the flower bud and not hurting the rest of the coming flowers or the plant itself. We had a great picking session and both filled our big bowls within 20 min or so of picking.. now on to the drying trays. 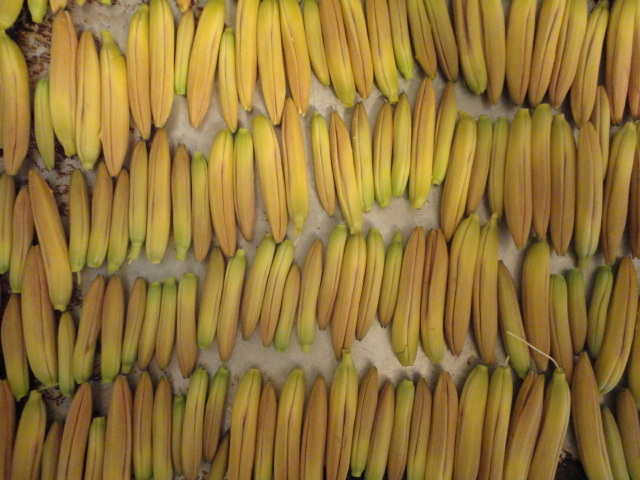 They will dry to a light brown color and will be used in different stirfries in winter, a couple more good pickings and I will have lots put away, with tons left over for freshing eating thoughout the summer. Happy Harvesting. Do you havest daylily’s for fresh use, do you dry them for later use? Have you ever bought them at the chinese market in fresh or dried form? Do you order them in your favorite dish? I love the sweet crunchy pop the fresh ones add to a dish. 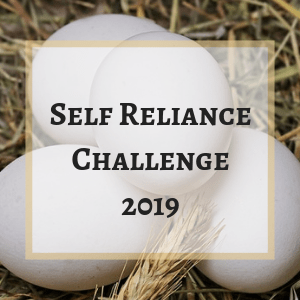 This entry was posted in frugal, gardens, wild foods and tagged 100 mile food challange, Food Production and Recipes, Frugal, Garden, Wild Foods. Bookmark the permalink.